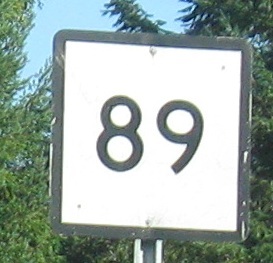 CT 89 NB in eastern Connecticut, turning from Turnpike Rd. 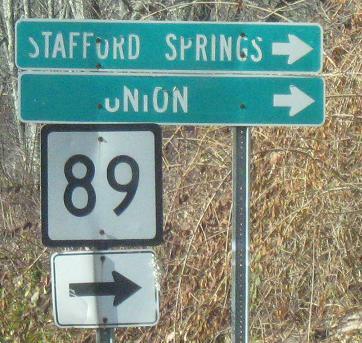 to Westford Hill Rd. 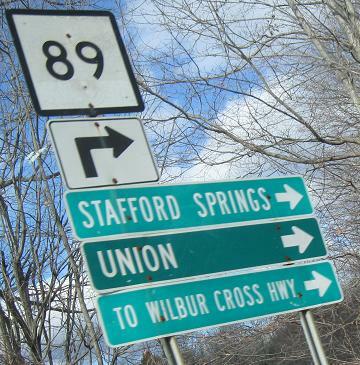 The signs in the first photo appear to be the first generation of green signs (other than the Union one), because this part of I-84 hasn't been referred to as the Wilbur Cross Highway in decades. (It still technically is, though.) 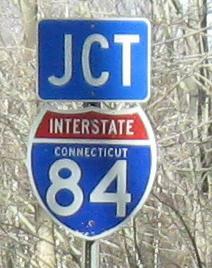 The name dates from when CT 15 continued east of Hartford to Massachusetts - remember, 15 is Wilbur Cross Parkway and then Highway before meeting 84.